Counsellors Title Agency understands the demands that real estate transactions can place on attorneys’ already hectic schedule. 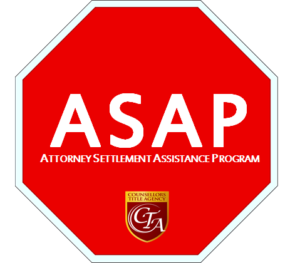 That is why the Attorney Settlement Assistance Program [ASAP] was created. This program was designed with YOU, the Attorney, and your needs in mind. Our Real Estate Secretarial Services are able to assist you in every aspect of the sale, purchase, refinance or loan closing process. We will directly communicate with all the parties involved in the transaction and coordinate and obtain all the items necessary to bring the matter to closing. These are just some of the many services that we can provide to you. Let us take the burden of Today’s Real Estate Transaction off of your shoulders. Our goal is to provide you and your clients with a smooth, stress-free closing process. Please contact our office to discuss your options and advantages of ASAP.